This year, the KCAD Green Council wanted to put a twist on the Annual Student Exhibition. The awards followed the model of “Metropolis Likes” – social media coverage on the top spaces, products, and ideas hand picked by Metropolis editors during New York Design week (learn more about this here). 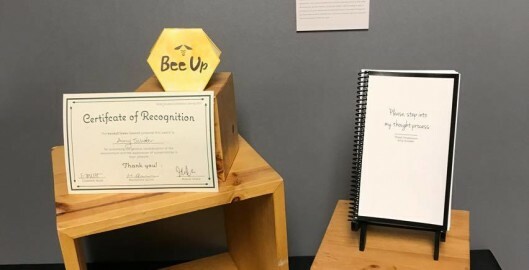 The KCAD Green Council handed out personally designed awards to students in the exhibition who they believed had work that best exemplified sustainability with materials used and concepts portrayed. 15 awards were distributed among all areas of study at KCAD by the Green Council. Student work included a diversity of mediums and backgrounds: from environmentally conscious clothing to wildlife illustration, furniture design to advertising, and innovative material processes to packaging design. Each piece was unique in the way it handled the complex topic of sustainability, whether or not it was the focus of the project. The KCAD Green Council hopes to continue these spontaneous awards in future KCAD exhibitions as an inventive way to inspire students to be curious about how their art and design could be sustainable.